Singapore was the first stop on my 2014 trip to Southeast Asia. I had already visited Asia twice before, but this time I wanted to do something a bit luxurious in each of my destinations. 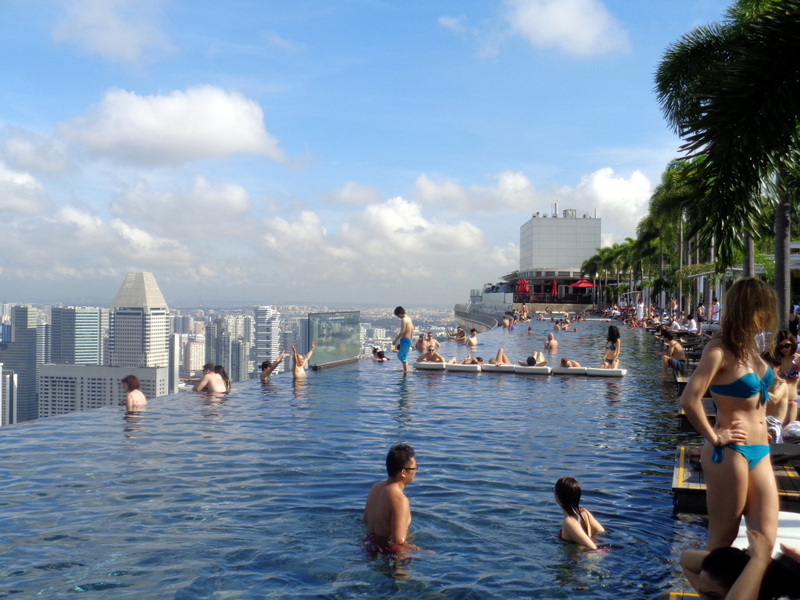 The infinity pool at Marina Bay Sands in Singapore was obviously the first thing I thought of, as it’s probably the most iconic and romantic attraction of the Lion City. But, I got quickly put off after reading the hotel website which said that only hotel guests can use the facilities. Visitors can only enter Marina Bay Sands SkyPark to get to the observation deck. Paying 20 SGD per person to get to a separate area of the roof didn’t appeal to me – especially after a visit to the Altitude bar in Singapore. Marina Bay Sands – How to stay there for an affordable price? How to get a room at Marina Bay Sands hotel for cheap? I love to treat myself to a bit of luxury sometimes, and I’m super happy if I have the chance to stay at some fancy hotels. But the price for a standard room with a harbor view at MBS is between 330 and 500 USD, depending on the season. I’m not rich by any means and this was definitely over my budget. However, I was able to use a travel hack to cut the cost. As I fly a lot, I tend to book my flights through Orbitz. I trust their service and I’m able to get some good prices through them. As a result, I’ve managed to collect a lot of Orbucks for each booking that I can use towards a discount on my next hotel stay. When I saw that I could use them towards staying at Marina Bay Sands, I didn’t hesitate for long and booked a superior double room for only $150! I stayed at MBS during my second stay in Singapore, a one day transit between Bali and Vietnam, so I knew the city a bit from my previous stay. Because of this, and the fact that I didn’t have much luggage, I decided to take the metro rather than a cab. The Bayfront metro stop is directly under Marina Bay Sands, so we didn’t mind spending a bit more time to get there. 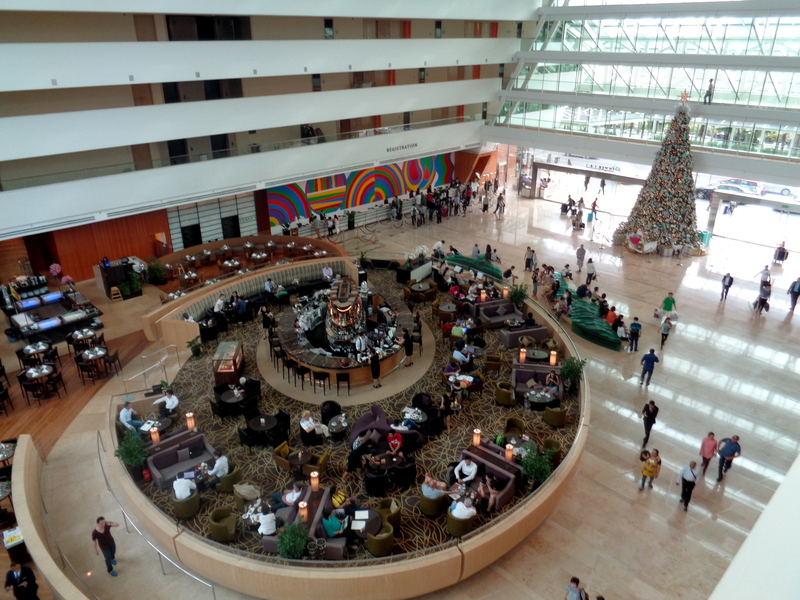 Marina Bay Sands is a huge hotel and it might not seem as romantic as a nice bungalow in the middle of the jungle. I was a bit concerned about how was it going to be, after reading some bad review. After all, I didn’t expect much from the room and I mostly wanted to use the hotel’s facilities – especially the infinity pool. Upon arrival I was warmly received and got my own porter (!). ‘Is this your first time at the hotel?’ the receptionist asked me. My friend and I said yes and he immediately checked something in the computer system. He smiled, and told us ‘we’ve upgraded you to a better room, no extra charge.’ A better room might mean many things and in the case of Marina Bay Sands, it might be a room located on a higher floor. We weren’t sure exactly what the upgrade was so we didn’t get too excited and my friend was quick to say that they probably do this for everyone. 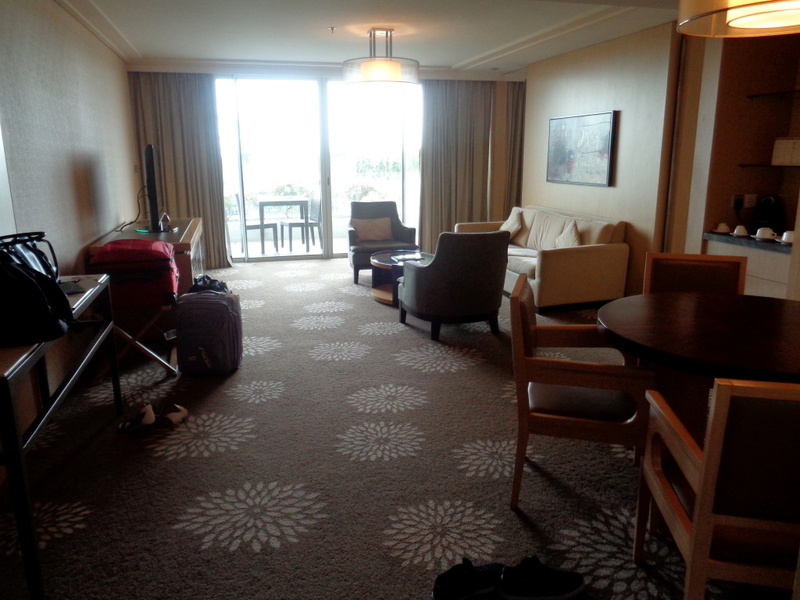 However, we were pleasantly surprised when we got to my room as we GOT THE UPGRADE! Why we got an upgrade – I’m not sure. I pitched to MBS before asking, if they could work with me. They apologized that they’re not allowed to give complimentary stays or access to the infinity pool, but who know. Maybe if they saw I’m determined to stay there anyway they decided to upgrade me. Big WOW when I entered! 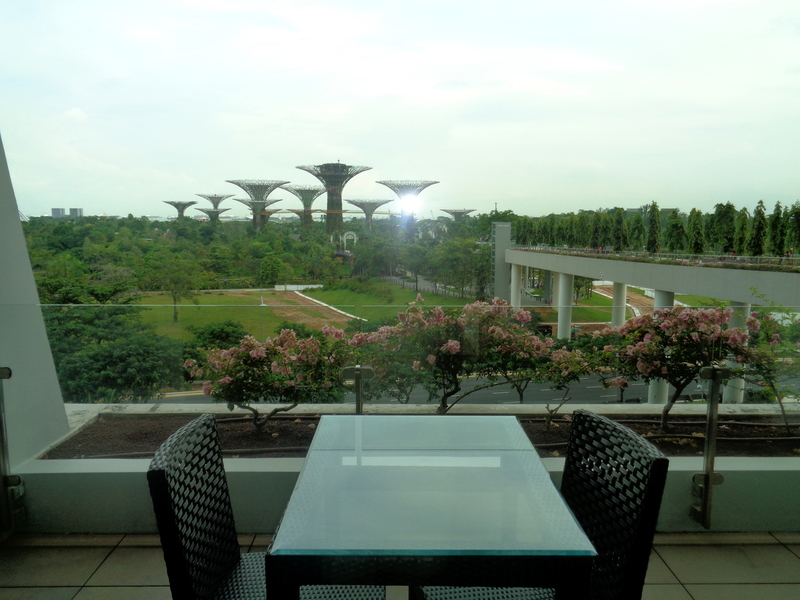 Technically, it wasn’t even a room, it was a huge Orchid Suite overlooking the Gardens by the Bay! The place had everything you could think of and even more. A big living room filled with Nespresso coffee, tea, newspapers, a huge TV, and a small bathroom on the side. From the living room we could walk out onto the terrace which had an outdoor table and lounge chairs. Behind some sliding doors, there was my bedroom with another TV, a work area with every possible adapter for electronics, and a lot of water. The bathroom (yes, another one!) was amazing, and I wouldn’t mind having one like it at home one day. It came with two sinks, a cosmetic table, a shower room, and a huge bath tub. I couldn’t believe it was all for us and we barely wanted to leave the room to enjoy the facilities to the fullest! On the way there I got a bit anxious about the weather. It got very cloudy and it looked like it was about to rain. Imagine if you had only one night to use this amazing pool and it rained! Luckily, the weather ended up being great the whole time, unusual for Singapore during this time of year (November). 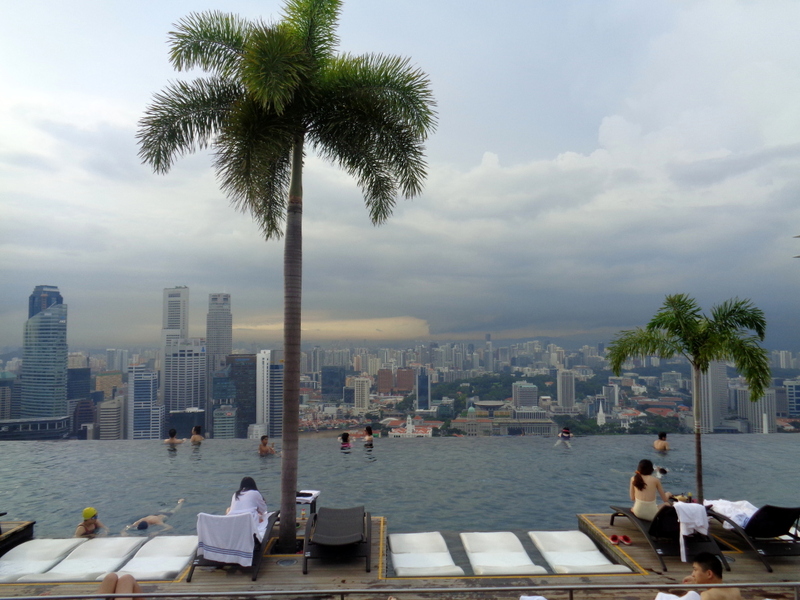 The attractions continued when I got to the rooftop to see the infinity pool. After reading some reviews that said that the pool was always crowded, I was a bit concerned, but it wasn’t more crowded than any other pool. We saved some lounge chairs for ourselves and jumped into the water. The pool isn’t actually very good for swimming as it’s quite shallow, but I swam for a bit. I didn’t see anyone complaining about it as we were all taking photos with the amazing view of the city in the background. If you sit on a lounge chair and watch, you can imagine that the water actually falls from the pool. Obviously, for safety reasons, there is an extra floor under the pool. Don’t worry – it’s invisible from the terrace, but you can’t see it. On the roof there were also many restaurants, bars, jacuzzis, a spa, and a gym. You can’t really ask for more! I enjoyed the pool during the day, but my friend was more excited to see it at night. The pool is open until 10PM, so we got to see a beautiful panoramic view of the city at night. 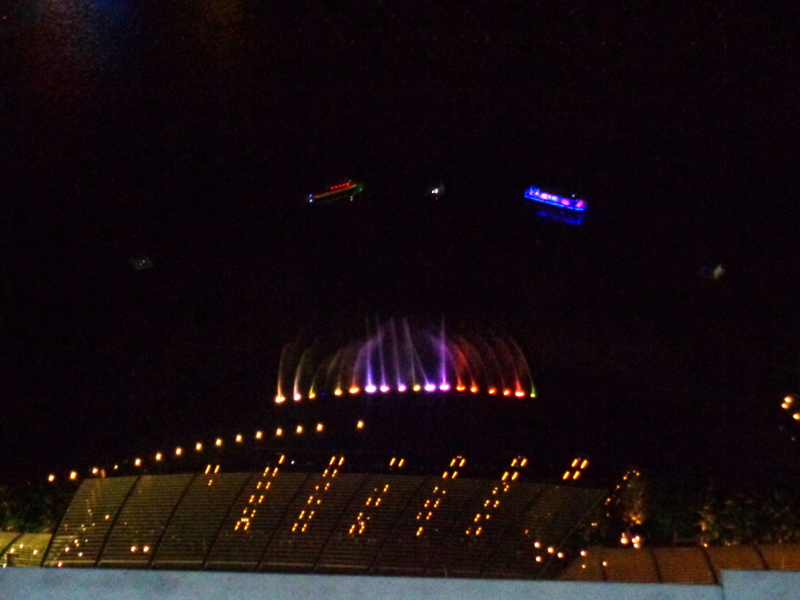 That’s not all though, the most impressive part of the evening visit was the fountain show. I’ve seen fountain shows in Dubai and Las Vegas and I thought that they were both impressive. The show at MBS beat them all for sure. There were holographic mermaids coming out of the fountains, Neptune sailing out of the dancing drops, and much more. Too bad I couldn’t capture it on camera! Was my stay worth it? Definitely! Would I pay the full price (700 USD) for the suite that we had? Maybe, if I had the money. The hotel might not be the most romantic place on earth. If you’re going on your honeymoon, I would recommend something more intimate, like Hanging Gardens Hotel in Bali instead. But MBS was still a great experience! I wish we could have stayed more than one night… At least I got a taste of the Singaporean high life. 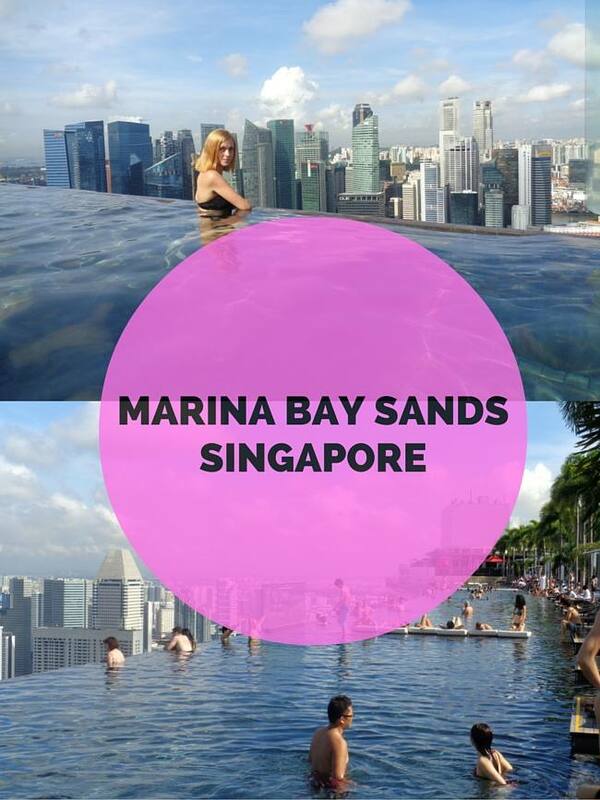 Check Marina Bay Sands prices now! Trick for saving on water: If you want to save money on water get a LifeStraw Water Bottle. It’s a water bottle with special filter that will allow you to drink tap water. Or even some from the pond, puddle or waterfall – everywhere! INSURANCE: Don’t forget to arrange a health insure before heading to Singapore. The easiest and the most reliable travel insurance is World Nomads Travel Insurance. Get it before your trip to avoid unnecessary troubles that might ruin your holidays! Wow! I really want to stay there and swim in this pool! Nice snag on the room cost and thanks for the review. Even though I would love to swim in around in the pool I would still prefer, as you said, a room in the jungle. i love reading your blog and it very informative as this year we plan along with my bf to travel romantic and affordable places in Asia .. I think we were just lucky hehe 🙂 My friends didn’t get an upgrade. If you like beach, I would highly recommend you to go Koh Lipe, Thailand. If you like quiet & not much people on the beach, go in between 15 May to 15 June. That’s the low season. This place is very peaceful & you can fully enjoy yourself on the beach during this low season time. Only a few hotel is good in koh lipe. One of the best is mali resort hotel which is facing the beach & have a wonderful garden view. I’ve lived in Singapore for two years and still haven’t stayed at MBS, but I might have to after reading your post. The Marina Bay Sands Hotel’s observation deck is spectacular… it’s actually the views that took me off my feet. Loved visiting it about 3-4 years ago. I’d definitely do it again! The Gardens By the Bay… by the way… were still under construction at that time. They look so surreal, I’m drooling to see them too next time I’ll be in Singapore! I got to see MBS built. I lived in Singapore for a little over 3 years. If you’re looking for romantic, try the Fullerton Hotel or the Fullerton Bay Hotel. Both are great! I think MBS is more of an icon than a romantic getaway. I haven’t stayed at Fullerton but maybe next time – thanks! Wow 150$ that is really not a lot for one night in THAT hotel. I have to sa that I was also on that swimming pool but not totally legal 😉 I have to come back to MBS and that time sleep there like “normal turist”. Hehe when were you there? My friend also just got into the pool in June 2014, but when I was there in November they started checking everyone’s room keys at the entrance, so I guess they figured out that many people were just illegally going. That’s funny as my friend visited me and we had to keep swapping cards with my bf so she could see the pool. It’s become super strict! Even press can’t swim now! Who could get tired of lovely imeags from paradise? LOL I’d love to be on that dock about now. Nice shot, love the water with it’s tropical look.Jimi Jones recently posted.. Excellent, very informative! This might be a silly question, but is there a place to leave valuables e.g. a camera when going for a swim? I just left my valuables on a sun lounger so I was able to see them all the time. I didn’t see any lockers to be honest, but the area is relatively small so I wouldn’t worry that much. would you know if its convenient with a 8 month old baby? What Does Brexit Mean for EU residents in the UK?